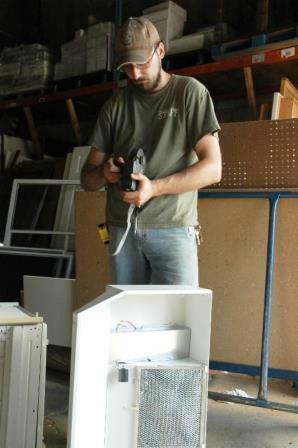 Arranging donated kitchen cabinets, one of the Forklift’s top-selling items, is like stacking adult building blocks for Doug Utterback. One minute he’s wrangling mismatched bundles of pine trim. 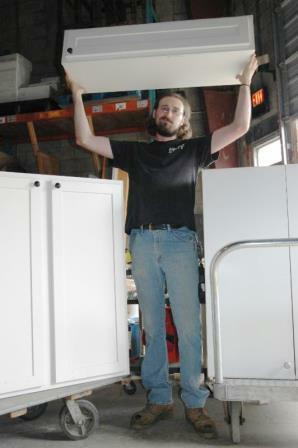 Next he’s hoisting an oak cabinet over his shoulder. Then he’s positioning sheets of drywall on a cart. Seconds later he’s shooting a stream of orange stickers from the ever-ready pricing gun poised at his hip. All of this while answering a steady rat-a-tat-tat of queries from curious co-workers and customers. Hectic is an understatement when describing Utterback’s daily schedule. 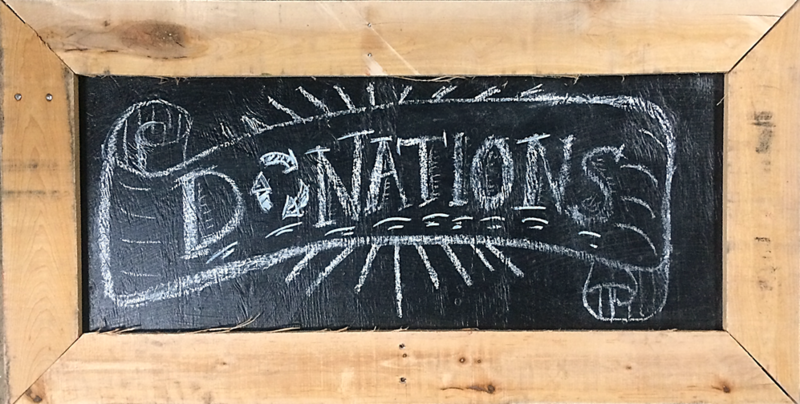 But as Community Forklift’s pricing coordinator for building materials, he has to maintain that staccato pace to prevent the entire staff from being buried beneath the mountains of donations that are the nonprofit’s bread and butter. A pricing gun is just one vital tool of the trade. “Even with 40,000 square feet, we run out of space in our warehouse quickly,” Utterback notes. And here’s why. His calculations show that in August alone, Forklift teams wrangled at least 5,500 surplus and salvage items – everything from boxes of nails to refrigerators – out on the sales floor. That adds up to a conservative estimate of 66,000 items annually. Just to drill down a bit, in the 10-month period ending in June, the Forklift received 3,906 doors, 874 appliances, and 192 kitchen cabinet sets. 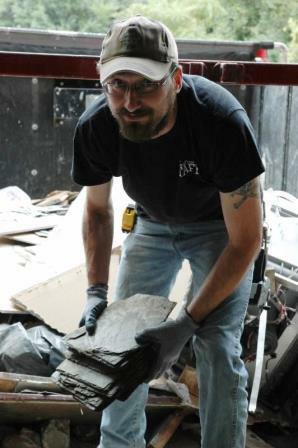 Doug unloads roofing slate from a truck at the Forklift’s Bay 3. Understandably, he bristles when the occasional provocateur tweaks him by asking why anything at the Forklift is priced at all. After all, questioners reason, if everything is donated, why aren’t Utterback and his colleagues just giving it all away? In August alone, Forklift teams unloaded, cleaned, sorted and priced at least 5,500 surplus and salvage items donated to the nonprofit. 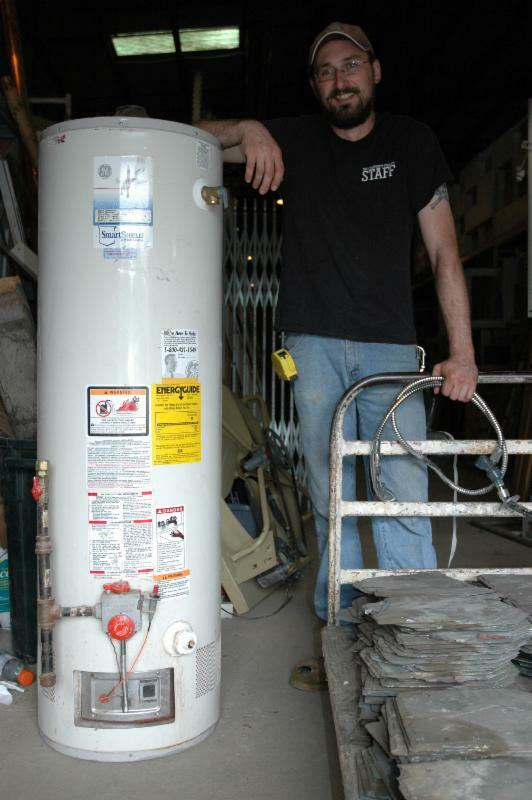 Here, Doug wrangles a water heater and a cart of slate dropped off at Bay 3. Utterback, a Cheverly native and an Eleanor Roosevelt High School graduate, has grown up with the Forklift because he joined the then-tiny staff in its infancy almost eight years ago as a general laborer. 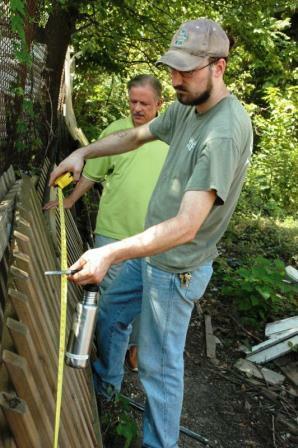 Doug helps customer Amiri Rokay measure a length of fence. That help-others-by-keeping-it-out-of-the-landfill ethic dovetails with Utterback’s personal principles. Wasting time, energy, money and other assets makes him crazy. Never mind the strain that such recklessness puts on the planet. Utterback emphasizes that what’s comfortable and comforting about the Forklift is that the people are just like family. And he isn’t just spouting clichés. Two years ago, he met his life partner, Aderyn Bright, on the job. She’s the Forklift’s events coordinator. The two of them are now immersed in parenthood because their baby daughter, Annwyn, was born in early October.